This beautifully renovated, impressive farmhouse is the epitome of tranquillity, space and luxury. It is in the attractive countryside of the Province of Groningen. The villa farmhouse with its impressive, richly decorated frontage dates from the beginning of the 20th Century. It represents the life style of wealthy Groningen farmers of that era. The unique holiday home has many of the original features and ornaments of those days. They are combined with all the comfort and luxury of today. There are cupboard beds which were used by the staff, interesting mosaics and stained glass windows. The old 'rosmolen', a horse-powered mill, is whole and entire. The heated indoor swimming pool with its heated terrace, sauna and jacuzzi will make your stay complete. The grounds are around 1.5 hectares and the original winding garden with its canal have been restored to their former glory. The farmhouse is in a traditional country area with open landscapes and beautiful vistas. Do visit some of the nearby historic villages with their impressive churches. 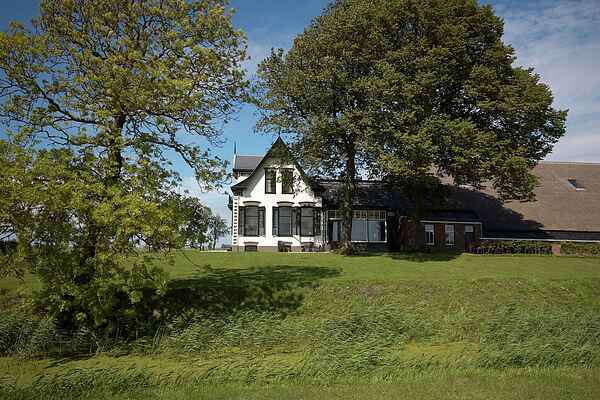 You can also see the historic Menkemaborg Mansion and Museum in the town of Uithuizen. The coast and the wonderful Hoogeland Wadden area are best discovered on foot. The Wadden Sea Seal Sanctuary and Wadden Walkers Centre in Pieterburen are around twenty kilometres away. The attractive city of Groningen is thirty-two kilometres away.